Disc golf and ball golf. Fairly open with strategic foliage. Greens, bunkers and water OB. Make sure they know you are playing disc golf (ball golf is only 9 holes). Insist on a disc golf map with notes (posted here). Tough to navigate without this. Most tees are painted on the golf cart path, the rest are carpet. Hole numbers and distances are stenciled on the tee pads. The holes flow the same way the ball golf holes play only there are usually 2 disc golf holes per ball golf hole. Carts available and affordable. Course maps, food, drinks and a full bar in clubhouse. Take U.S. Hwy 19 just north of the Pasco County line to Holiday, Florida. Go east on Flora Ave. 0.75 mile to the course parking lot on the right. 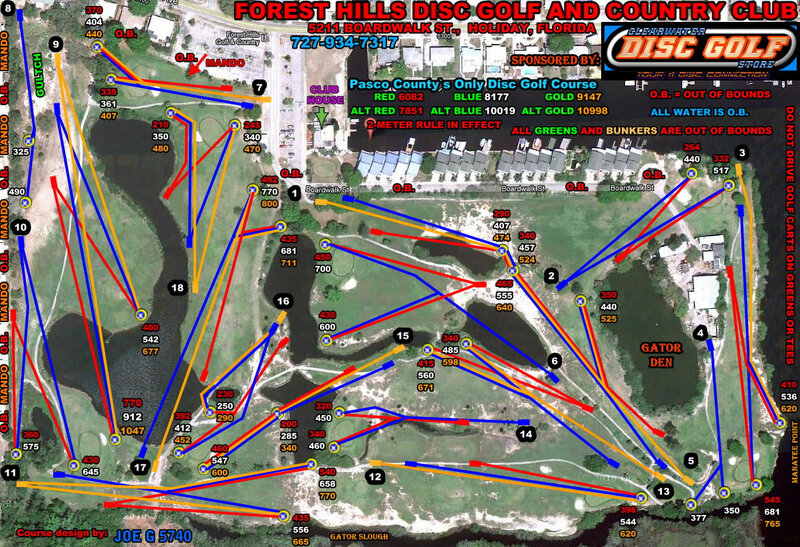 Have you played at Forest Hills Disc Golf and Country Club? Be the first person to review this course!